ECO Walraven pulled up the stringer, which had six striped bass on the end of it. Confronted with the overwhelming evidence, one of the fisherman admitted to keeping the fish on the stringer. The fish were still alive and were released. The fisherman was issued a ticket for possession of striped bass out of season, returnable to the Village of Haverstraw Court. On Feb. 24, ECO Adam Johnson received a call about a fisherman keeping striped bass out of season and putting them in his vehicle near Piermont Pier. ECOs Johnson and Jon Walraven responded and stopped the suspect’s vehicle as he was leaving the parking lot. The driver admitted to having five striped bass in the vehicle and was ticketed for possessing striped bass out of season and failing to have a marine registry. The ECOs continued checking fishermen along the pier and encountered five more individuals in possession of striped bass. The stripers were hidden inside two more vehicles and among the rocks along the pier. 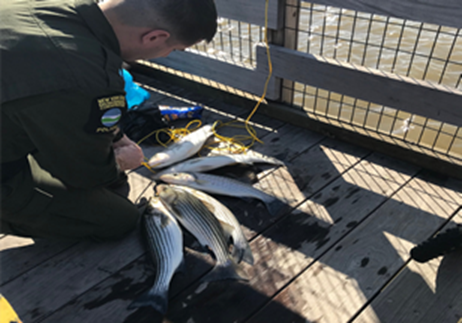 In total, the officers seized 20 striped bass from six individuals and 10 tickets were issued for possessing striped bass out of season and failing to have a marine registry. The living fish were returned to the Hudson River. All of the tickets are returnable to the Village of Piermont Court.